Sadly, this is only the second or third time I’ve seen this movie (despite the fact that I own it). However, it was really good, as usual. So, the first time I saw this film was during a summer film class in my MA program where we focused on auteurship and Spike Lee films. That means that when I watch it, I’m always remembering those issues of shot-type, camera angles and lenses, film stock, and general composition. This time around, with a little bit of distance between me and the film, I was struck by the artistry of many of the shots. There’s a particular sequence that occurs when Malcolm X is first gaining serious popularity. In this sequence, we’re hearing a voice over of one of his more famous speeches, and we’re seeing images of him sitting on a bed in a hotel room watching actual footage from the Civil Rights Movement (and the events leading up to it). In this sequence, every time we see Malcolm the camera is slowly zooming closer and closer on his eyes so that by the end we’ve moved from a full body shot to an extreme closeup of his eyes (and those iconic glasses). I never paid much attention to this sequence before — most likely because I was busy watching the newsreels and trying to figure out the context of those events (which I’m much more familiar with now that I’ve just finished all the readings on the African American literature portion of my reading list, and since I’ve taken a couple of classes that touched on the historical and cultural context of that era) and wasn’t able to really look at what Lee was doing with it. 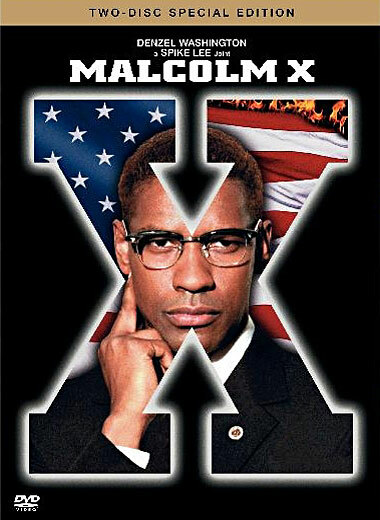 I think it’s a really nicely done sequence that helps to help the viewer understand the complexity of the situation Malcolm X was in — preaching the ideals of one belief system while watching the real-world occurrences he was trying so hard to help people overcome. Okay, so on a far less serious note, I enjoyed the use of wide-angle lenses throughout the film, and the colors and stylization of the entire opening portion (with its bright colors, choreographed movements, and elaborate wardrobes). Great film — I’ll have to revisit it more often.